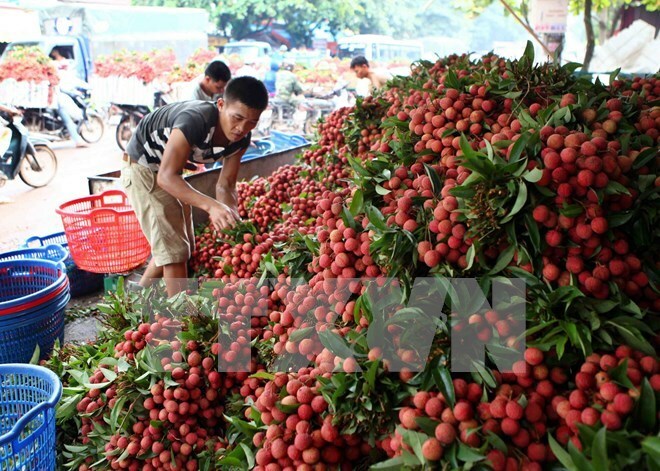 Hanoi (VNA) – Australia, which needs to import 1.7 – 2 billion USD of fruit and vegetable each year, is a potential market for Vietnamese fruit and vegetable but its strict quarantine regulations remain a great obstacle, said the Vietnam Trade Office in the country. According to the Vietnam Customs, Vietnam exported over 1.3 billion USD worth of goods to Australia in the first six months of 2016, of which fruit and vegetable made up 10.3 million USD. The figure for 2015 was 19.6 million USD and for 2014, 17.4 million USD. Currently, Australia has licensed the import of Vietnamese fresh lychees only with more than 10 tonnes shipped to the market so far. Vietnamese dragon fruits and mangoes are expected to enter the market in the coming time. In late June, a delegation from Australian Department of Agriculture and Water Resources came to Ho Chi Minh City, the Mekong Delta provinces of Long An and Tien Giang, and south central coastal Binh Thuan province to inspect the cultivation and harvest of dragon fruits as well as other steps before the fruits are ready for export. According to the Vietnam Trade Office in Australia , the visit is an important part in the risks analysis process. The Australian Government is scheduled to release a draft report for public comment at the end of 2016. Vietnam conducted evaluation of market access for dragon fruits right after Australia approved the import of Vietnamese fresh lychees in 2015. The process to pave the way for fresh fruits to reach the market takes at least two years, the office said. Besides fruits, Vietnam can look to expand its export of frozen, dried or processed fruit and vegetable to Australia, which currently imports 5-7 million USD worth of frozen mixed vegetable from China, but only 1,000 USD worth of the same products from Vietnam. Australia also spends between 8-10 million USD on vegetable and dried mixed vegetable from China, but a mere 20,000-30,000 USD on those from Vietnam.